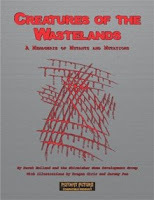 Skirmisher Publishing LLC is pleased to announce the release of Creatures of the Wastelands, a collection of monsters, mutations, and other material designed for use with Goblinoid Games’ Mutant Future and other post-apocalyptic games ($7.99, SKP E 0912, 80 pages; authors Derek Holland and the Skirmisher Game Development Group; artists Dragan Ciric and Jeremy Pea). It is available as a PDF download on several online sales venues, including DriveThruRPG and RPGNow. * More than 200 new creatures, including the terrible Great Mother, several mutant dinosaurs, the warlike Lumbricid, the insidious Silver Sheet, and the mysterious Smart Stones. * More than 50 mutations, including the new the Parasite mutation type and a number of Plant mutations. * Several odds-and-ends, including new terrain types, new materials, and a number of non-creature hazards. * Original illustrations by fantasy artists Dragan Ciric and Jeremy Pea. Creatures of the Wastelands is fully bookmarked and designed to be printer-friendly and easy-to-use and includes low-resolution screen-friendly and high-resolution printer-friendly versions both of its cover surfaces and its interior pages.